The Respa Indulgence 3' Mattress combines Respa's 3-dimensional RespaGel Grid with a foam encapsulated RespaForm Pocket Spring System offering a truly indulgent sleep surface. With Sleepfresh Technology from Actipro and a cooler fabric this mattress has thermoregulation qualities. Offering a medium - soft rating and edge to edge support, this luxurious mattress is finished in a traditional quilted soft knitted cover with layers of pressure relieving foams. 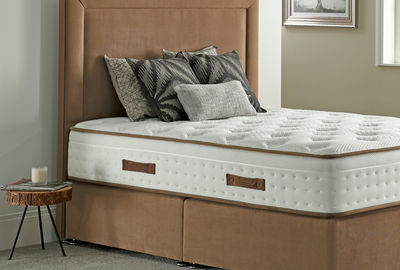 The Respa Indulgence 3' Mattress is part of the Respa Serenity Collection of Beds and Mattresses. Combining a Foam Encasulated RespaForm Pocket Spring System with Respa's Unique 3-dimensional RespaGel Grid, this mattress offers a truly indulgent sleep. Incorporating Sleepfresh Technology from Actipro, a natural probiotic with anti-allergen properties, ensures a hygienic sleep surface and the Cooler Fabric offers a refreshing night's sleep. Providing Medium-Soft Support, this Non Turn Mattress features Edge to Edge Support across the mattress surface and the Traditional Quilted Soft Knitted Cover with layers of Pressure Relieving Foams provides additional comfort. This mattress is 31cm Deep. Complete with a 6 Year Guarantee, the Respa Indulgence Single Mattress benefits from Free Delivery and Free Collection and Recycling of Your Old Mattress throughout Northern Ireland, and Counties Monaghan, Louth and Dublin, in the Republic of Ireland. We'll also unpack and place your New Mattress in a room of choice and dispose of all the packaging.